Joel contacted us a few weeks ago about making a website for his bail bond business. Originally, he setup a free account through Google Apps in hopes that he would be able to create a website. Unfortunately he found that the task was more complicated than expected and he didn’t know how to code HTML websites. So he was concerned not only with the initial setup of the site – but maintenance and updates of the site going forward. Therefore, he chose to go with us for his full website service solution provider – including website hosting, domain name management, and website design. We created a website based on the information he provided for his site and acted quickly to add in the additional content as he sent it. With the websites that we create, our customers are empowered to manage and maintain their own website once we are finished – without having to know HTML coding. It is pretty easy to manage a website created by BsnTech Networks with the web page editor that we provide along with the freely available video tutorials that we’ve personally created for our customers. We appreciate the business from Joel and the trust he put in us to provide all of his website service needs for his bail bondsmen website design request. 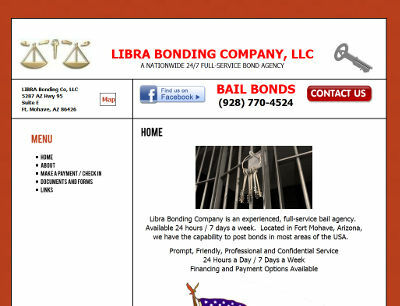 Libra Bonding Company, LLC’s website is at librabonding.com.